Welcome to Global Investigative Services, Inc. background check page for the American Association of Daily Money Managers. This page details the process for requesting your own background check as part of the application process for your membership with AADMM. Global Investigative Services, Inc. (Global), the company who will process the background check through their secure online background screening platform, has been conducting background checks for the past 25 years and is accredited through the National Association of Professional Background Screeners (NAPBS) Background Screening Credentialing Council (BSCC). To become accredited, firms must demonstrate initial and ongoing compliance with the accreditation standard as prepared by the BSCC. Global works with companies throughout the world to secure qualified candidates, by providing a complete array of investigative screening services. Every transaction and communication through our background screening platform is automatically encrypted and performed in a secure environment that safeguards against any potential threat. You can be assured that your personal information is well protected. To learn more about how we protect your personal information CLICK HERE. Once you have submitted your information into Global's background screening platform and paid for the background check, expect results to be returned within 24 to 72 hours (business days). Some areas or searches may take longer or delays may occur due to court closures and weather conditions. Should you have any questions or need any assistance, please contact our office via email at [email protected] or toll free at 800-589-6595. To begin the process for your background check, decide which option below to select for processing the background check(s). Review both A & B options. Click on the button below that best describes your AADMM membership type. Are you an AADMM Agency currently using Global for employment background checks? If so, click the button below. 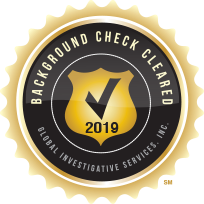 Background Check Cleared Program is for Individual and Agency Members and their Employees. The Background Check Cleared Program (BCC Program) is designed to assist businesses communicate with consumers that their employees have gone through a thorough background screening process. The employees are monitored monthly, guaranteeing your organization maintains a properly vetted workforce. Participating in the BCC Program allows organizations to exhibit complete trust and transparency within their organization and throughout their industry. When doing business with a company that is participating in the BCC Program, you can be assured that the organization has done proper due diligence meeting their company standards, policies and has taken the necessary steps to protect employees, clients and others who seek to do business with that organization. The BCC Program is designed to assist participating companies with guidance on properly vetting employees, by providing an outline of specific criteria to be considered in the evaluation of each background check report returned with criminal offenses. It is the employer’s responsibility to have a policy and procedures in place when conducting background checks and most importantly, for those organizations in the United States, to follow the Fair Credit Reporting Act (FCRA) as well as any state or local laws, when evaluating the eligibility for employment based on the results of a background check (also known as a consumer report). Communicating with the public that your organization conducts thorough background checks, has never been easier. Displaying the Background Check Cleared Badge on your website, marketing material, retail store window or any other location you feel it needs to be displayed, communicates to the world that your organization can be trusted.